I was looking for a party favor for an adult beach party. I love to collect shells, sea glass and rocks on my walks on the beach. My rocks would do just find for this project! When I was in a craft store, I found these ceramic starfish beads, which added the perfect touch for my beach scene on the rocks. 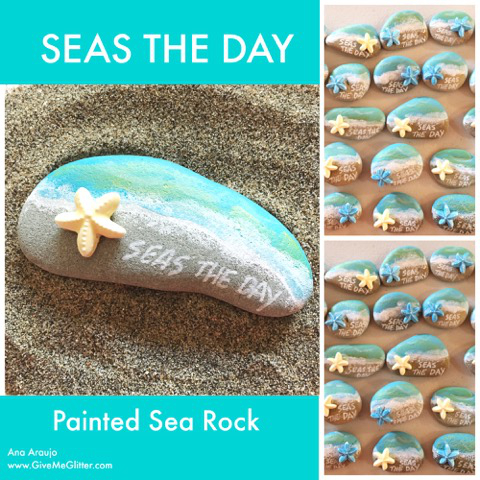 Let me show you how, with a few easy steps, you can create your own “Seas The Day” Rock. Find a rock (or rocks) that will lend itself to a beach and sea. Puddle three shades of acrylic paint next to each other. Dip the brush into paint, picking up each of the colors, then paint across the rock to create the sea. Continue until you have the shoreline, lightly paint the Green Flash (this will give the sea an iridescent look, like the sun is beating down on it). There you have the sea meeting the beach. Paint a strip of white following the shoreline. Be sure the paint is going on a little thick. Here’s the fun part you get to finger paint! Tap and smug your finger along the white paint to create the sea foam on the beach. Continue this step across the rock. Remove one of the star fish beads from the strand. Glue the starfish in the left hand corner of the rock, let dry (if the starfish slips, put a piece tape over it to hold it in place until it dries). Continue with the paint pen… “THE DAY”. You may have to trace over the words. Or if you have a steady hand you could paint the words.